Singapore could not be prouder as a nation than it is today as swimmer Joseph Schooling brings home the gold in the 100m butterfly in a record 50.39 seconds. Celebrating the big win with Singaporeans all across the world are several global and local brands. Changi Airport was one of the first brands in Singapore to put up a post congratulating the 21-year old swimmer. Just this morning, as Schooling landed in Singapore, the group decided to flip the boards in honour of his arrival, bringing its social media activation from online to offline. Since then several other brands have followed suit. Local telco StarHub was one of the first telcos in Singapore to put up a post having a little bit of fun with wordplay saying Schooling “schooled” the rest of the world in the pool today. A+ for effort goes to Honestbee, which gave out 1,000 hand-made chocolate gold medals to customers who ordered yesterday. The hand-made medals were delivered together with the grocery bags. Singapore Airlines gifted Schooling with a KrisFlyer Elite Gold card, and one million KrisFlyer miles “because the king of the butterfly deserves a great way to fly”. The Coffee Bean & Tea Leaf kept it classy with its simple Facebook post which earned it 362 reactions. It is known to work with digital agency Happy Marketer. Mini, working with local agency Govt Singapore, also put up a post saluting Schooling. True to its style, Netflix put up a witty post just 40 minutes ago saying there is a new star in the pool. Marketing understands that Netflix works with home-grown creative agency TSLA for the Singapore market. Grab was one of the first few brands to jump on Schooling’s win, offering free rides for him and his family. To make things even sweeter, Grab is giving away discounts for rides to swimming complexes. Oppo also took time to congratulate Schooling on his win on its Singapore Instagram page. It also took Schooling’s win as an opportunity to tout its VOOC Flash portable charger fast charging speed on Facebook. 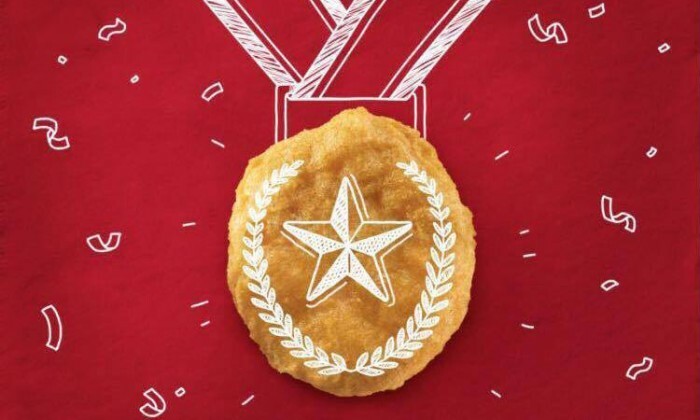 One of the more cheeky initiatives goes to McDonald’s, which compared Schooling’s gold medal to a “golden nugget”, paired with a Chicken McNugget promotion where it will give out free nuggets to customers. It also changed its Facebook cover image in support of Schooling’s victory. KFC was also quick to congratulate Schooling on his victory, attaching a gold medal onto a chicken drumlet. It also celebrated Schooling’s homecoming through a congratulatory Facebook post, accompanied with a giveaway of an original recipe drumstick with any meal purchase. Nandos also placed out a social media post featuring a french fry in the shape of a swimmer as well as ketchup in the shape of water. This was accompanied with the caption, “Jo! You made the red dot red-hot!”. The ad was conceptualised by TBWASingapore. It also earlier posted a similar image saying “Joseph, you’ve fired up the nation!”. The toy giant placed out a social media posting featuring “50.39”, Schooling’s winning swim timing built in Lego brick pieces. “With the advent of technology, we have retrained staff for higher-value job functions that will transform our business and allow ..